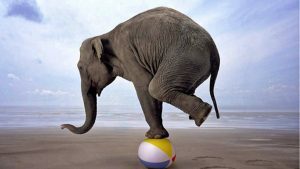 Helping your aging parents with money management issues can be a delicate balancing act. Wondering how to give them advice, when to insist on a tough conversation and when to let it go? Read on for 3 ideas to help in a manner that actually works. With advances in medical diagnosis, treatment of chronic diseases and lifestyle improvements, we are all living longer. That is wonderful news, and it is landing us all in some unexplored financial territory. Many Baby Boomers and Gen X-ers are lying awake at night trying to figure out how to do it all: pay their mortgage, save for the kids’ college fund and contribute to their own retirement. Oh, and don’t forget about making sure their aging parents are okay financially. Anxiety about aging parents and their money is the elephant in the room. We hide from it, say that we are just too busy, or pretend that we avoid that room by choice. The truth is that we just aren’t comfortable talking about it. When your parent is obviously unable to manage his or her own money, the choices are simple. But what do you do when they are independent-minded and appear to be capable of handling their own finances (at least most of the time)? How can you help in a manner that is actually helpful? Just be there as a safety net and a sounding board, yet avoid irritating them? Here is how you might think about this puzzle. The reality is that life gets more complex every day, and we could all use a little minimalism. Help your parents pare down the moving parts of their financial life for both simplicity and peace of mind. Here are some ideas to start. If Dad’s wallet is bursting open with too many credit cards, perhaps now is the time to consolidate them. Choose a card with a low APR, transfer balances and close the cards that aren’t necessary. Keeping one or two major credit cards is sufficient for most people. If your parents love their department store credit cards for special rewards, that should not be a problem as long as the balances get paid off regularly. Mental note: if those balances are growing and the money to pay them off just does not seem to be there, you have a subject for a bigger conversation about lifestyle choices and available resources. Automated bill pay is a fantastic way to remove a monthly chore off your mental checklist. It can even save your parents from such unpleasant surprises as insurance policy cancellations! True story: a friend of mine did not use autopay for her health insurance premiums, opting instead to mail a check every month. This process worked just fine – until she got hit by a car and had to spend several weeks in the hospital, drugged up and going through multiple surgeries. She lived alone, her children lived out of town, and there was no one to open the checkbook and write that check for the monthly premium. You can guess where this is going: her health insurance lapsed while she was at the hospital. Don’t let this happen to you! If your parents are technology-savvy, you can walk them through setting up automated payments for their utility bills. If they are not, you may choose to do it for them. As long as there are sufficient funds in the checking account to cover the outstanding amounts, no one has to remember to write the check. Once you have helped your parents optimize their credit cards, bill payment system and budget (or anything else they may have asked about), step aside. This part is challenging, but the reality is that unless you observe indicators that your parents are no longer capable of managing their own finances, the bank accounts and credit lines are theirs to handle. That being said, it is a good idea to remain alert to any red flags that may point to mental decline, elder financial abuse or fraud. Here is a short list. Utility services get turned off repeatedly for non-payment. Your parents keep opening new credit cards. Mom or Dad mention seeing a large check or withdrawal from their account that they do not recall authorizing. Depression, anger or anxiety over being able to make ends meet. Resistance to talk about any of these topics. They may be too embarrassed to tell you about having been defrauded, fooled, or just over their heads. Don’t miss the warning signs. Read my recent post 5 signs to spot elder financial abuse to get more ideas. Connection is the ultimate antidote to the negative effects of aging. In addition to being supportive of your parents’ involvement in their community, help them build a network of trusted professionals. Encourage them to ask questions. Reinforce that when it comes to money, the old maxim of “better safe than sorry” still applies. Every aging parent should have a CPA in his or her Rolodex. A CPA can help with a long list of questions, concerns and decisions that affect their lives. Here are some of the typical areas where you might turn to a CPA for assistance. Bonus tip: if you are looking for a professional who can be trusted with taking over paying the bills for your parents, look into daily money managers. There are professional firms that specialize in helping people with their household finances. They can handle anything from paying utility bills to decoding medical invoices and negotiating with creditors. Sometimes, giving up the daily management of household money questions is a powerful way to give your aging parents more control and allow them to live independently for longer. Just be sure to investigate all costs and fees to avoid surprises.